What is an Evocative Mechanism? To put it simply, it is a mechanism within a board game that is technically very straightforward or even simplistic, but in the context of the game expands to encompass not only a broader set of mechanics but thematically represents doing something much more complex. The example on my mind this time around is this Commander role in XCOM. This role is given the simple matter of counting the budget to make sure the number of units placed on the board in defense of earth did not exceed a limit. In practice this gives the Commander influence over each of the other roles, and the responsibility of allotting each role a number of units they can use. This simple mechanism really captures the feel of commanding a team without being complex or convoluted, and it leaves the system open enough for players to try different strategies and really feel part of the action unfolding in the game world. The Commander commands without strict lists of rules on how he or she can interact with the other players. In short, an Evocative Mechanism. This all lead to a discussion of what the term actually encompasses, and what “theme” is, and somehow we got to whether or not Reiner Knizia, famed abstract euro designer, was actually one of the most thematic gamers out there. (This discussion in part activated by this article) I needed some time to fully collect my thoughts, because deep down I had a sense that this wasn’t right but didn’t have a clear argument. That leads us here, to this, so let’s get into it. And let’s start in the best way I could think of: let’s define what a Thematic board game really is. Themity theme, What be ye? In the article linked above, (and again right here), the author argues that card art and fancy components do not a solid thematic game make, and our good friend Reiner Knizia is a master of the true thematic game. Examples cited include Modern Art, Tigris & Euphrates, and of course Knizia’s Lord of the Rings. Which, I will concede do offer some sense of theme, or at least basic emotional response. This stems from the issue that despite a common language, everyone has their own connotations for any word we choose to use as a descriptor for something. I’ve heard the argument before, generally from players tending toward Eurogames. I guess to prove that Eurogames really ARE better because not only do they have better mechanics but Thematic games don’t even really do what they claim to do, that is provide a thematic game experience. The argument is that miniatures and card art are just distractions that hide poor gameplay, and don’t really provide theme and immersion. Obviously, I completely disagree with this notion. But let’s talk about why. Problem numero uno as far as I can tell is actually terminology. You can make a legitimate argument that an Abstract Knizia mechanism that evokes a feeling of sacrifice is actually more thematic than reading some flavor text and rolling some dice. You may even be right – depending on how you define the term “thematic.” See, in a book or a movie, “Theme” refers to an emotional or ideological element running through the backbone of the story. 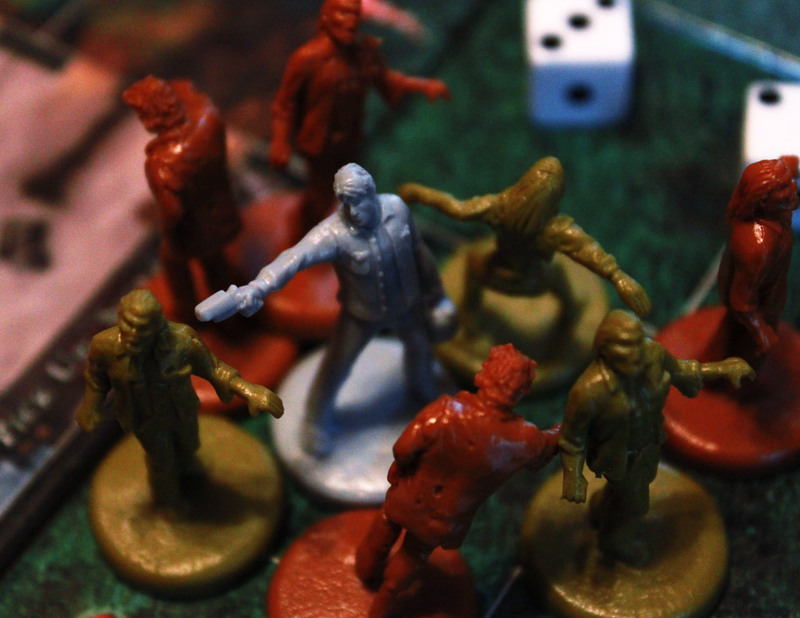 Betrayal, love conquers all, brotherhood, sacrifice – these things are “theme.” But in a board game, when we say Thematic we mean something completely different. Thematic goodness comin’ at yo’ face! This stems from the issue that despite a common language, everyone has their own connotations for any word we choose to use as a descriptor for something. You can end up going in circles arguing about what word to use even when everyone is talking about the same thing. Example: in the Knizia article, War of the Ring is compared to Knizia’s Lord of the Rings. The author says that War of the Ring isn’t thematic, it’s “action.” Okay, fine, we like “Action” games then. Of course, not all thematic games are about “action” so maybe a better word is “literal.” Perhaps storytelling, or role-playing, or any of a hundred different terms. Perhaps none of these words are perfect, but in order to move forward you just kinda have to agree to accept a single term and the common definition for that term. Because in the end, the same groups of people will still pick BSG over Tigris & Euphrates regardless of whether BSG is a Thematic game, an Ameritrash game, or an Action game, but arguing about which word to use just gets us stuck. I just don’t use “Ameritrash” because quite honestly because it sounds like a term an elitist eurogamer came up with and doesn’t really describe the genre at all. I only mention the term here because many gamers have heard it and are familiar with it. So I’m going to use the word Thematic, because these sorts of games – regardless of how thematically “evocative” in their mechanics they are – are trying to accomplish something beyond just a collection of mechanics. They’re trying to capture stories, worlds, universes, characters. It implies a focus on the top layer, the presentation, the place where players connect with the game. A thematic game is one that gives players a sense of filling a role within a storied world. Pages of backstory in the rulebook. “Require” is the keyword here – a thematic game can have these things, they’re just not integral to the definition. I feel as if this definition is clear, yet broad enough to encompass a wide variety of thematic games. Yet I want to keep us all on the same page, so let me break this down into chunks and explain my intentions. This phrase is important, because arguably every game puts players in a role. Yet not every game gives players a sense of filling that role. If I play Puerto Rico, I may be assigned the role of a plantation owner by the rulebook, but as I play I’m not thinking about being a Plantation Owner. I’m thinking about the game’s mechanics. In a thematic game it’s important to give players the feel of being who they are in the game, whether it’s a character in a pulp zombie film or the emperor of a massive space empire. You have a sense that you’re fighting off Zombies or searching for Cylons. You may still need to use your imagination to fill in gaps, but the game wants to convey the experience. Thematic games come in a wide array of forms. Some take place on a much more personal level – a few characters going on a quick adventure (such as, say, Infiltration). You might also have characters going on a much more epic adventure (Eldritch Horror), or groups of characters encountering world-altering events (War of the Ring). Or you might be running a civilization from the top down (Twilight Imperium). Whatever the case, you’re not just moving pieces around a board, you’re participating in the adventure. It’s important that you realize “role” doesn’t mean “play as a single character.” There are plenty of Thematic games that don’t give you a character name or an avatar. In War of the Ring, you’re not technically playing as a single individual within middle-earth. Still, as you play you feel invested in your party, in keeping Frodo alive to deliver the Ring. In a sense your “role” is the unseen power of good mentioned by Gandalf, or maybe it’s just that you’re taking on the role(s) of the whole Fellowship. It’s difficult to define from the outside, but as you’re playing the game it’s clear you are a part of this world and you care what happens. That’s a necessary element of any character. It’s why in the movies, the rogue individual who starts out carefree and detached always comes around and makes a difference in the end. Because if they didn’t start caring about the world around them, they wouldn’t be very likeable anymore. Another aspect of the “Role” is that you have an influence on the [game]world around you, that you have options to pursue and activities to perform. Having a “role” means you care about what’s happening around you, and that you can do something about it. I toyed around with tackling each of these words separately, but in the end decided they were too intertwined and I needed to tackle them both together. I felt like the word “story” implies storytelling as the game genre, and this isn’t necessarily required. You can have a thematic game that doesn’t necessarily result in full story at the end of it all. But, the story element is kinda important, so how do we fit that in correctly? World is very important. A “role” as mentioned above isn’t very meaningful without the context around in which that role operates. But “world” isn’t necessarily enough to capture the whole idea. A world can be static and uninteresting and not very thematic at all. So I put the two together. “Storied world,” implies a place that players have a context in which they can enact their roles, and also a place where their roles can make a difference in what happens. I use “storied world” here with the intent to imply that things don’t play out the same way every time, but that things do have a progression, a story to be told based on the players actions. This world can be enormous – as in Twilight Imperium, it’s a whole galaxy filled with planets – or very very small. Battlestar Galactica takes place in and around a couple ships. Infiltration takes place in a single building. My definition may not be perfect. I’m sure any number of you guys can point out where this definitely falls apart, or exceptions to the rule, or something that is missing. But I think this definition gets the idea across enough that we can choose to be on the same page and move forward. The point I’m trying to get at here is that the thing a Thematic Gamer is looking for when they play a thematic game is not “theme” in a literature sense. Players don’t play Battlestar Galactica because they want a sense of “betrayal” – if that’s all they wanted, The Resistance would certainly be enough to fill their desires. What they’re looking for is a full story, a desperate battle for survival on an outmatched starship. They want to play in the world of the TV show they watched, and that’s exactly what they get. Sure, there are themes of betrayal, distrust, and desperation, but all of that adds to the story – the world of BSG, which players participate in. They create their own story and change the flow of events based on their actions. And that’s why Knizia’s Lord of the Rings doesn’t really hold up as a Thematic Game in the eyes of those who play Thematic Games. Sure, you may have a few “thematic” elements, but players aren’t making their way through Middle Earth, fighting Orcs and destroying the One Ring. They’re still just playing with numbers and mechanics. And that’s why War of the Ring is thematic in board game terms, because despite its birds-eye view of the whole thing, players have agency. They drive the campaign, they decide where battles are fought and where the Fellowship dissolves. They have roles in a storied world. What “makes” a thematic game? Now that we’ve established what “Thematic Board Game” means and differentiated it from what the term “Theme” means in literature, we can talk about the stuff in the box that actually makes a game Thematic. Components are the physical elements that make up a game; this includes boards, cards, tokens, and documents. Mechanics are the specific laws for how components are used, or how players interact with each other and the game. Gameplay is how the mechanics form together to create the overall arc of the game from start to finish. So, how does each of these elements create the theme of a board game? I’m not going to try to create a succinct law for each one, but I’m going to try and break down some of the ways each one CAN add to the theme. While some people might see no difference between Gameplay and Mechanics, it was important to separate them and here’s why: The primary way (good) board games generate theme is by focusing on Gameplay over mechanics; it’s about the whole experience, not each individual part. That’s why many “thematic” games tend to be clunky – designers come up with mechanics to create opportunity for player interaction, not just with other players but with the game world. Since thematic games are often more open ended and freeform, designers want to make sure their players have choices. As a result, more mechanisms are usually required to handle actions for those choices. I think overall, designers are getting better at streamlining their mechanisms while maintaining the core desired gameplay, but you’re rarely going to have a truly streamlined thematic game when compared to eurogames. This is also why I love “evocative mechanics” – y’know, the idea that started it all – because it’s about simpler mechanics that still capture the full, expansive gameplay that a thematic game needs. 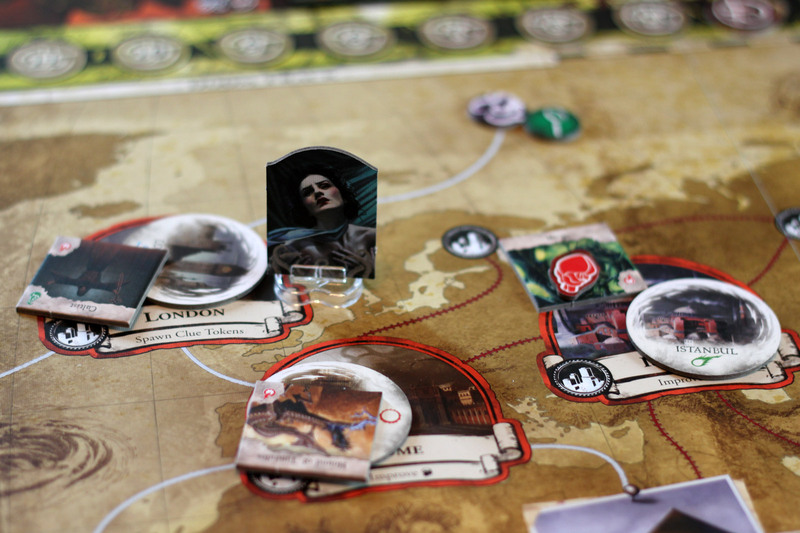 Gameplay is all important for the thematic game, because whether players are playing cards, moving miniatures around a board, or rolling dice, they want their gameplay to capture the “feel” of something. For thematic games, Mechanics need to serve the theme and the gameplay. Each mechanism is a way the player can interact with the world. The mechanism doesn’t have to correspond immediately to the real-world action – you don’t need to give players something to physically punch to create immersive combat. You don’t need a board with a map to create an immersive world. You can use those things, but I think more important is giving the player options. That’s why thematic games tend to give players full hands of action cards, or allow them a bunch of action points to spend on different things. You’ll find fewer “structured turns” a la Power Grid (ie all players do X, then all players do Y where X and Y are very specific activities) because a thematic gamer wants to decide if they’re going to run, hide, or shoot. The onus is on the designer to create mechanics for each of these things in order to capture the intended scope of gameplay. “Without the art and plastic miniatures, would the mechanism still feel thematic?” I’ve been asked this question and variations of it many times. This goes back to the implication that fancy components disguised bad mechanisms or poor gameplay. It’s a subtle message that says “the game isn’t actually that great, it just tricked you into thinking it was fun with a coat of paint.” As if aesthetics can’t actually improve a gameplay experience. Whether players are playing cards, moving miniatures around a board, or rolling dice, they want their gameplay to capture the “feel” of something. Listen, sometimes miniatures and cool art can be distracting and hide the fact that these components lack any actual substantial gameplay. At the same time, implying that a game should be just as fun whether it’s minis and art or cubes and… well, no art at all… seems a bit silly to me. After all, we have art galleries with paintings that people visit without any sign of gameplay or mechanics. We watch 2 hour movies without any interaction at all with the medium, and we don’t ask whether the Avengers would be as fun of a movie if we never actually saw the Hulk punch a giant alien in the face. Sure, you may have a different mindset going into a game than taking a field trip to the art museum, but the point stands that visuals, characters, and story can help us connect emotionally to something. Not that anyone will be moved to tears by board game art, but it can colorize the game world, spark the imagination, and connect the player with the actions they’re taking. In short, great art, cool tokens, and even an interesting written backstory can add to player enjoyment, and that’s not a bad thing. No, components are not a replacement for gameplay. But good components can enhance the gameplay resulting in a better overall game. And sometimes they can take an otherwise mediocre experience and turn it into something you can really dive into. Of the three categories, Components are definitely the easiest. I don’t mean that to say that designing great components or creating great art is easy, but getting it into a game is far easier than great gameplay or quality mechanics. Components don’t require a heavy amount of balancing; you don’t have to test and tweak and test hundreds of times to get components just right in the same way that good gameplay requires. There are a lot of great artists out there, and each image doesn’t have to hit DaVinci levels of artistry in order to be great board game art. That’s why we see so many “heavy-on-the-art, light-on-the-gameplay” products. You can pay for good art; not so much for great gameplay. Yes, gameplay is the most important, and the hardest to get right. Most poorly designed games I’ve played had a lot of potential, they just lacked the full extent of refinement, leaving confusing, disjointed, or entirely dysfunctional elements. In many cases it’s pretty clear that the designer either didn’t get many playtests outside of a core group or simply ignored feedback from external sources. Quality gameplay is what separates the average designer from the great one; pretty much anyone with design aspirations can put together a game system that “works” mechanically but just isn’t particularly unique or fun. And mechanics, mechanics are where thematic games could stand to see the most growth. Frequently gameplay is solved by adding more rules in order to add options or catch edge cases. This has worked for gamers willing to put the effort in to remembering all these details, but I think we can do better. And I’ve started to see it. Dead of Winter seems to have condensed a BSG-esq game to a few pages of rules. XCOM can be learned as you play even if everyone in the group is a newbie, thanks not only to a helpful app but a ruleset that strips everything down to the essentials. There’s plenty of room left for designers to explore in this vein, and that bring us back to where we started: the idea of the Evocative Mechanism. The simple action with greater meaning. It was discussing the idea of an evocative mechanism that my friend Lenny brought up Knizia and shared the article that argued Knizia is a master thematic game designer. It should be clear by now that I disagree; based on our definition of a Thematic Game. Fantasy Flight’s team has done an excellent job of creating a number of immersive, thematic games that go far beyond anything Knizia has created. Reiner Knizia may be a master of simple rules with clever hooks, and maybe even mechanism that can evoke a feeling, sensation, or theme (in a literary sense). But it’s not capturing what We the Thematic Gamers are looking for, and that’s why no matter how hard you argue that Knizia is thematic, we still don’t really want to play his games. When it comes to the question of Evocative Mechanics, it goes beyond the simple perception of theme. It’s about providing options. Here’s the thing about that XCOM budget thing. By putting you in charge of the budget, the game doesn’t just make you feel like a Commander. It gives you options and choices and actions to take within the game world, all based on that simple budgeting system. Because you know it’s bad to go over budget, but everyone wants a piece of the pie, it gives you the agency to come up with a plan and assign money where it’s needed. The system is fluid enough to allow you to create your own plan and run with it. Let me say it another way; it expands your options without expanding the number of rules to remember. 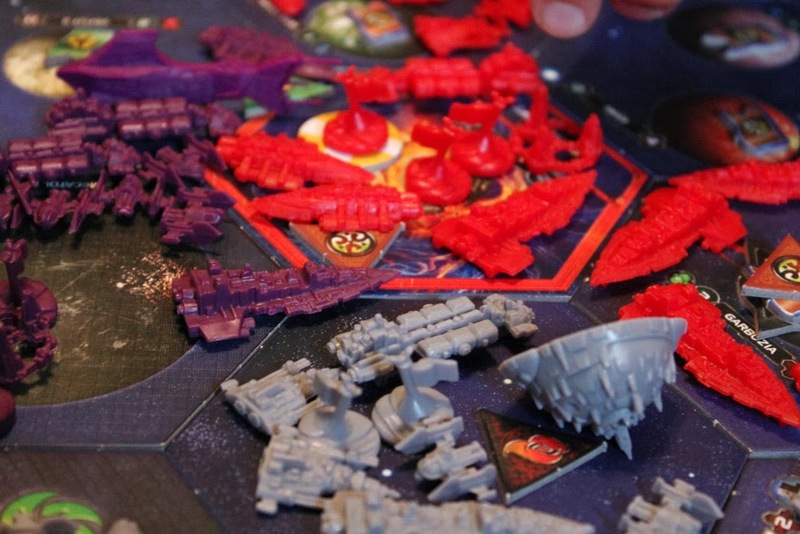 There are not as many examples of this as I’d like to see, but here’s another from perhaps a surprising source; Twilight Imperium. Yes, TI3 is a big ol’ messy game with pages upon pages of rules, and could probably stand a bit of streamlining. But it also has the Command Counter system, which manages to condense a whole lot of rules down while actually broadening the horizons of the previous editions. No longer do players have to move all of their units at once. No longer does the game need to be divided into numerous phases. 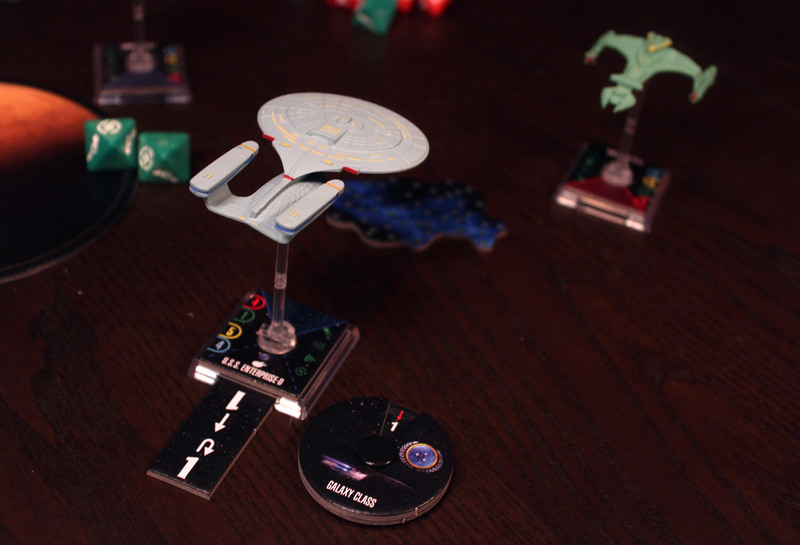 Instead the game unfolds dynamically, allowing players to take turns moving their ships, building units, and even unlocking different parts of the game such as trading, politics, and technology research. The command counters mark activated systems and ships which saves a whole lot of memory in the world and keeps the flow of the game active and filled with tension. It fulfills the needs of the theme, enhances the gameplay, and shaves off a number of rules in the process. It’s actually rather streamlined for a game its size and weight, yet it captures the theme and keeps the players in the emperor’s chair. It’s a system that works really well and creates a more open system that players can play in. Whereas Knizia’s mechanics, while clever, tend to keep players boxed in. They still have choices and tension and challenge and all that, but they’re caged within Knizia’s system and don’t have a lot of freedom to explore. The goals are clear and there are set channels to get there, and while it may be difficult to travel down those channels, you can’t suddenly take a side route or pursue another goal. We don’t need 1-page rules or games that can be taught in 5 minutes. We don’t mind spending some time learning the system and digging into an expansive game. So what am I calling for here? It’s not Knizia games, that’s for sure. I knew it in my gut, and I’m glad I was able to define it a bit better, to understand why it wasn’t Knizia. Because I’m all for streamlined, smooth mechanics, even as I’m all for dice rolls and big, epic games. Can we merge the two? Can game designers go beyond simply creating rules to handle every possible situation, or can they start digging into something beyond that? Simpler systems that are easy to learn, that give players boundaries within which they can explore? Because I admit it – many big thematic games (which I love) are clunky and obtuse, and they don’t necessarily have to be. I don’t want to turn Battlestar Galactica into another spreadsheet Euro just to make the rules easier to learn, but I do want to see more XCOM Commander sorts of things. I think we can do it. We don’t need 1-page rules or games that can be taught in 5 minutes. We don’t mind spending some time learning the system and digging into an expansive game. We like our options, our dice rolls, our themes. Yet going forward, digging into better, smoother mechanics might not only make our games more accessible; they might be able to expand our game worlds and unlock options without adding pages and pages onto our rulebooks. Now excuse me, I plan on playing Twilight Imperium in 2 months so I’ve gotta start setting up the game and give the rules a fresh read-through. For more random thoughts on board games and other weird stuff, follow @futurewolfie on twitter. The article was very interesting and well thought. Thank you! On the other hand, I found some logical ambiguity about your approach: You started by declaring that before going further on what game is thematic, we should define what we mean by thematic. I completely agree. Then comes the tricky part, for choosing the definition first you chose a group of games that are commonly called Ameritrash, and suggested to rename this group of game to Thematic games, and then came up with a definition that approximates the border of this group of games. Lastly you concluded that some games (Kinizia games in particular) are not thematic based on this definition. Now we knew that knizia games are Not ameritrash at the first place. So the whole argument can be seen as: If we try to define what are Thematic(ameritrash) games, then we conclude that the games that were not considered as Ameritrash won’t be in this category, or even simpler: The non-ameritrash games are not ameritrash. The other problem is that you refer to Thematic lover games as “We”, as though you implicitly claim that this definition of thematic games is the agreed definition for all who like themes in games, which is not true, basically because of the very article you gave the link about Kinizia being a thematic designer. I think his point for choosing a word and moving on is encapsulated here: “Because in the end, the same groups of people will still pick BSG over Tigris & Euphrates regardless of whether BSG is a Thematic game, an Ameritrash game, or an Action game, but arguing about which word to use just gets us stuck.” There’s something the games he likes have that Knizia games don’t. I think the essence of the problem is in fact correctly stated here: “You can make a legitimate argument that an Abstract Knizia mechanism that evokes a feeling of sacrifice is actually more thematic than reading some flavor text and rolling some dice. You may even be right – depending on how you define the term “thematic.” , after this point what is given is first choosing a definition, and then categorizing the games based on that definition; which by the mentioned statement is completely legitimate. But I cannot see why this definition and the following categorization is any better than for example a definition that includes a relevant mechanics into consideration and a categorization based on that definition, other than that the latter definition wouldn’t probably be as good as separating the Ameritrash games, but then why it should be? We didn’t agree that the Ameritrash games are The thematic games. Otherwise there was no need for the whole argument. It’s fairly common for “Ameritrash” gamers to use the term “Thematic” as an alternative, because it comes close to capturing the idea of what Ameritrash is all about. “Dripping with theme” is another common phrase, and one referenced in the linked article about Knizia, but treated there with disdain. My goal is to establish that when “Ameritrash” gamers think of theme, thematic games, and/or games “dripping with theme” they think of it in terms of the definition I give above, so the argument that Knizia games have stronger “theme” isn’t going to convince “Thematic” or “ameritrash” gamers to play more Knizia games because it’s not the type of “Theme” we’re looking for. And the reason why I’m trying to establish this definition is to help define what i’m looking for when I say “evocative mechanics” – I’m not looking for Reiner Knizia-esque “thematic” mechanics, I’m looking for mechanics that create a “thematic” or “Ameritrash” experience. It’s not about defining the ultimate definition of “theme,” I’m just using the word “thematic” because it works, and trying to establish a clear definition of what I mean when I use that word in this context. Otherwise we get stuck in a cycle of one person, such as yourself, arguing that theme can mean something different. Sure, it can. But that’s not the point of this article. The point is I’d still rather play BSG or XCOM than Reiner Knizia’s Space Empire 2025. Ok, I agree. If the point of article is to clear up what do the lovers of “Ameritrash” games (I also use it because it is commonly used) mean by thematic, and why it is unlikely that they see a Knizias-style game as thematic, then it is right to the point and the argument is correct. I am sorry, I just misunderstood the point here. On the other hand, as you also mentioned in the article, I can see how one can also claim he likes theme in the games, and exactly because of that he loves Modern Art for example. There are different perceptions which refer to a one word (“thematic”). Very interesting, I always knew that the game needed to give you the impression that you were actually a commander or plantation owner for real and that many games failed to do so. But I could not actually point out how. One thing I found is the concept that board games are a bit like dream. You can have some illogical mechanics like dreams can have illogical concepts, but if you have too much of them you will snap out of the dream. For example in Puerto Rico, since the only illogical mechanic is the role selection system, I still feeling that I am a plantation owner despite the role mechanic. But in agricola, there is too much illogical mechanics to make me feel as a farmer. I called it the inception therory, because I got inspired after watching inception movie. Else, in summary, you seem to say that in order for a game to be thematic, you need to give players a lot of choice so that they could feel a bit like a table top RPG where they can actually do anything. One thing for sure, it should be more suitable for video game or computer assisted board games like XCOM because many mechanics could be hidden to the user, so giving player more choice does increase the amount of rules the player needs to learn. But streamlining some rules could actually help sove that problem, but it you streamline too much then the mechanics becomes more abstract so less thematic. It’s a though balance to reach. Another situation I experimented it was when playing a improvised solo game as a toy. There was an infinite amount of actions I could do which made me feel like if I was there and doing them for real. “My definition may not be perfect. I’m sure any number of you guys can point out where this definitely falls apart, or exceptions to the rule, or something that is missing. But I think this definition gets the idea across enough that we can choose to be on the same page and move forward. I kind of feel that there’s a big fat strawman lurking at the heart of this article. Even if someone is making the argument that minis and superfluous art don’t make a game thematic, nobody is arguing that they automatically make a game poorly themed. Nobody is arguing that BSG is not a “real” thematic game and if they are they’re a drooling moron. BSG is a thematic game par-excellence because it immerses the players in two core elements of the show – the inability to fully trust anyone, even yourself, and the constant sacrifices and hard decisions needed to keep the journey going. Yes, the art and the characters and the wonderful way that the characters in the game reflect their role in the show are all part of what makes it great as a thematic game. But if you, to provide a hypothetical example, made an X-Wing clone with Kara and Hot Dog and the rest battling cylons in their vipers…. it wouldn’t be a good thematic game, because BSG HAS dogfights, sure. But its not ABOUT them. That’s the kind of distinction Barnes was driving at, even if I think he deliberately chose a provocative example. You make a compelling argument that the surface features of theme – chrome perhaps? – are necessary to make a fully thematic board game. The point about needing a specific sense of place is particularly astute – I think of my own joy when unfolding the aGoT map. I love T&E, but I still wouldn’t class it as a thematic game. But the point is that chrome is – or shouldn’t be – sufficient. You’ve got to remember that the article you quoted isn’t from some arch Euro-snob. This is the same guy who previously claimed that Princes of Florence ruined boardgaming forever. I like Barnes’ article alot even if I don’t fully agree with it, because I think it’s an effort to break down the idiotic eurogame/Aremitrash barrier and get to think a little more deeply about games – that a game with lots This article seems to be an effort to build those barriers right back up and it makes me a little sad.